We value our patients' experience at Melby Chiropractic Clinic. If you are currently a patient, please feel free to complete the following Client Experience Questionnaire. The Questionnaire is in Adobe Acrobat format, and requires the free Acrobat Reader to view. "Whether I am coming in for a maintenance adjustment or a new unmanageable pain I have, Dr Melby ALWAYS takes the time to listen. Actually, several times he has fixed stuff I wouldn't have even thought would be chiropracticly (is that even a word?) related." "During the delivery of my second child, my pelvis twisted and basically put my right leg out of the socket, and with the help of chiropractic, I can now work out and do routine daily activities like I used to before I had children! When I walk in the door, it feels like Cheers, where everybody knows your name!" "Dr. Pitt displays a genuine concern for her patients and their well-being. She carefully listens, then proceeds to provide the care she believes would be most beneficial. The Melby Chiropractic staff are kind, considerate professionals who create a welcoming environment for their patients. Within a few visits you are on a first name basis and feel part of the family." "I was recently diagnosed with trigeminal neuralgia and my pain was about a constant 7. My [medical] doctor could only offer me painkillers and other drugs and no hope for long lasting pain relief. After a handful of adjustments by Dr. Bill, I feel great! I’ve resumed normal life and practically forget about the pain I was in previously. My family has been going to the clinic for 10+ years and we feel like part of the family there." "I love the friendliness of everyone. I feel very comfortable with all of the staff. I think Dr. Pitt is doing a great job. She seems to be very thorough and checks on progress." "Treatment at Melby Chiropractic Clinic has helped keep our bodies in alignment and functioning, especially as we age. It is always wonderful to enter a business and see a smiling, welcoming face, and Chrissy is that person. She makes you feel good just seeing her. Andrea is the behind the scenes person who is very helpful, friendly, and knowledgeable about the different therapies. 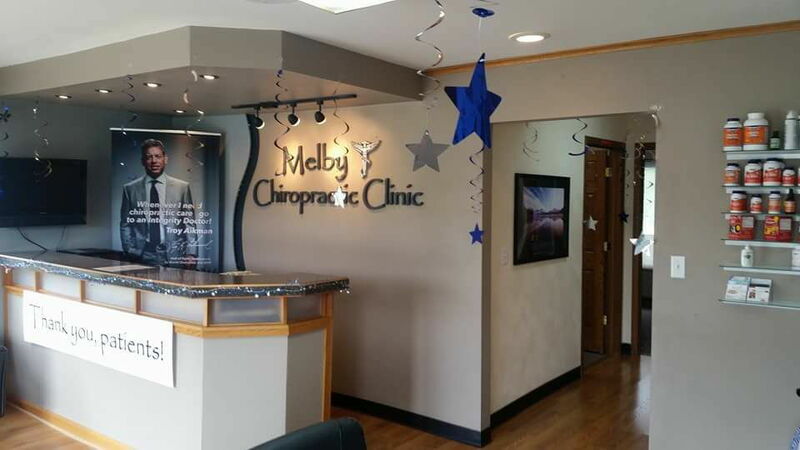 Melby Chiropractic and its employees is an asset to us and our community."